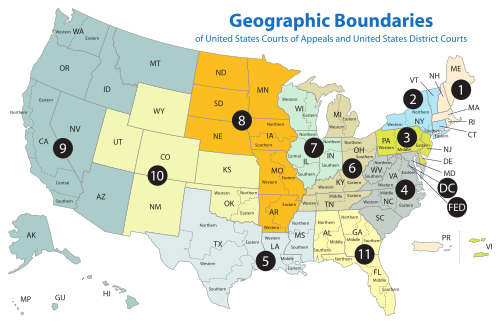 The United States District Court for the Southern District of Mississippi (in case citations, S.D. Miss.) is a federal court in the Fifth Circuit with facilities in Gulfport, Hattiesburg, Natchez, Meridian, and Jackson. Appeals from cases brought in the Southern District of Mississippi are taken to the United States Court of Appeals for the Fifth Circuit (except for patent claims and claims against the U.S. government under the Tucker Act, which are appealed to the Federal Circuit). The United States Attorney for the Southern District of Mississippi represents the United States in civil and criminal litigation in the court. D. Michael Hurst Jr. was confirmed as the U.S. Attorney for the Southern District of Mississippi on October 3, 2017. Jurisdiction (Counties): Adams, Amite, Claiborne, Clarke, Copiah, Covington, Forrest, Franklin, George, Greene, Hancock, Harrison, Hinds, Holmes, Issaquena, Jackson, Jasper, Jefferson, Jefferson Davis, Jones, Kemper, Lamar, Lauderdale, Lawrence, Leake, Lincoln, Madison, Marion, Neshoba, Newton, Noxubee, Pearl River, Perry, Pike, Rankin, Scott, Sharkey, Simpson, Smith, Stone, Walthall, Warren, Wayne, Wilkinson, and Yazoo. 5 Edwin R. Holmes MS 1878–1961 1918–1936 — — Wilson appointment to 5th Cir. 14 Charles W. Pickering MS 1937–present 1990–2004 — — G.H.W. Bush appointment to 5th Cir. ^ Initially appointed to the District of Mississippi in 1836 by Andrew Jackson; reassigned to both the Northern District of Mississippi and the Southern District of Mississippi in 1838. ^ Recess appointment; formally nominated on December 10, 1891, confirmed by the United States Senate on January 11, 1892, and received commission on January 11, 1892.